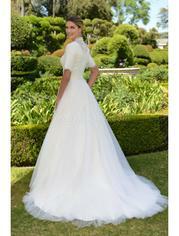 Modest ball gown with all-over lace high illusion top, satin waistband and with medium length sleeves. High lace illusion back with zipper and buttons. Court length train.